TFW you want to play Breath of the Wild but we only have n3ds... A Link Between Worlds it is! 2018 – Here we go! Before January ends, we want to wish you all a great 2018!! The festivities are over, the year just started and we’re well into the working rhythm of the new year but it still feels like 2018 appeared out of nowhere, even if we welcome it with wide open arms! The tic toc of Time keeps going, so let’s stay committed to the resolutions (ah yes, we mean you too! Don’t let yourself quit if it’s something that you believe is a tool that can get you closer to the person you want to be! But keep it positive, always. No need for bad energy that ruins your Karma★★). With so many things on the list to focus on and, as always, searching methods on how to improve and keep learning more (never enough! ), one of our resolutions is to give some space to better ourselves and balance the personal and work life, because the scale can’t just go tipping crazy to one side! Controlling this workaholic streak we keep falling into is a priority from now on, since it has resulted in bumps on the road over time, specially health issues (which are stable now. Phew…). Despite this, please don’t worry, we are aware that we have been posting seldom lately – mainly because sometimes we are asked not to share the works before they are made public by the client and we end up postponing in such a way that we lose track to post it later on…- We are resolute in changing this streak. We love sharing what we do with you and everyone that visits our dear Starlitden! We hope you get some good vibes from us as we’re sending them out, trusting that we all keep striving and positively achieve our goals! Give us all the sun kisses you want. We have sun blocking lotion!! Since we’re going back to submitting recent works to Deviantart (an art community online), we thought it would be a nice cross posting opportunity, since we’ve been wanting to post this fiery couple for quite a while. Hey everyone! We’re sharing another snipet of a study for an illustration. And now, back to work!! Pencils detail of the sketching phase. Since we can’t yet share the work we’re doing at the moment, here’s an illustration detail waiting to be inked and coloured on standby mode. It’s called the Wheel of Fortune and it’s fueled by the idea that the Wheel will keep turning no matter what. And that you are strong enough to work with it instead of letting it drown with you. We believe in you! Give it your best and don’t get discouraged! Work together with the Wheel of Fortune! Hi the re everybody! Here’s the Cat and the Fox together at long last to start bringing you posts more often! This marks the beginning of a true team-ness feeling for this blog! Woohoo!!! Truth be told, it always saddened us that there was no true way to show that these posts are actually written by two people/pests so we hope the adding of our avatars will change that! Yep, this feels a lot better! So today we’re dropping this quick concept art for a future pinup. 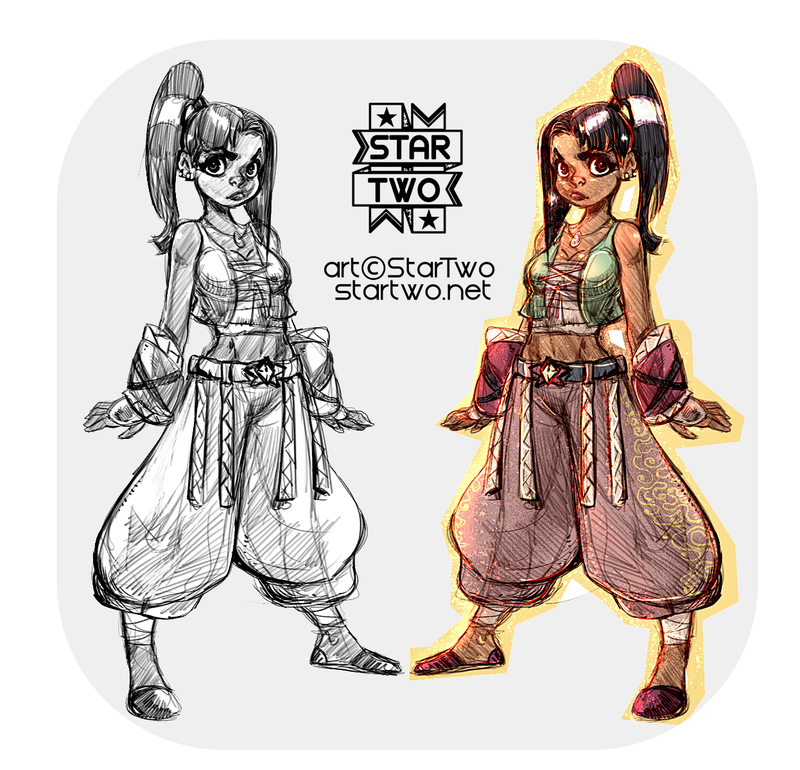 We usually discuss an idea, then we do a quick character study until we’re satisfied and then we add a bit of colours. We might tweak the colours when we get closer to the final product but what matters is getting a feel for the character first. This is it for now! If you have any questions for us don’t be shy! We’ll be more than happy to reply the best we can. And now back to celebrating this success and more to come soon! Bye everyone! No point in imposing a set of rules to someone who moves at a different pace. But meeting halfway should be the solution for those with enough willpower… Sometimes?